Fritz Klein (24 November 1888 – 13 December 1945) was a German Nazi physician hanged for his role in atrocities at Bergen-Belsen concentration camp during the Holocaust. Klein was born in Feketehalom, Austria-Hungary (now Codlea in central Romania). Klein was considered a Volksdeutscher, or ethnic German. He studied medicine at the University of Budapest and completed his military service in Romania, finishing his studies in Budapest after World War I. He lived as a doctor in Siebenbürgen (Transylvania). In 1939 as a Romanian citizen he was drafted into the Romanian army, where after the outbreak of the war with the Soviet Union in 1941 he served as paramedic on the eastern front. In May 1943 Romanian dictator Marshal Antonescu, on a demand from Hitler to release ethnic Germans in the Romanian Army, drafted them into the German army. 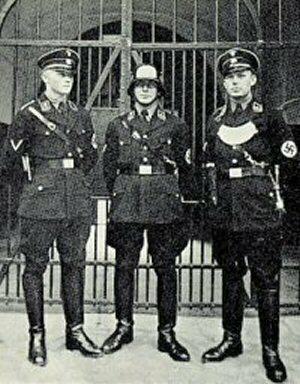 Hence Klein became a soldier in the Waffen-SS, was listed in the SS-Personalhauptamt, and was posted to Yugoslavia. On 15 December 1943, he arrived in Auschwitz concentration camp, where at first he served as a camp doctor in the women’s camp in Birkenau. Subsequently he worked as a camp doctor in the Gypsy camp. He also participated in numerous selections (“Selektionen“) on the ramp. In December 1944 he was transferred to Neuengamme concentration camp, from where he was sent to Bergen-Belsen concentration camp in January 1945. He remained at the camp with commandant Josef Kramer and assisted in handing it over to British troops. Klein was imprisoned and required to help bury all unburied corpses in mass graves. 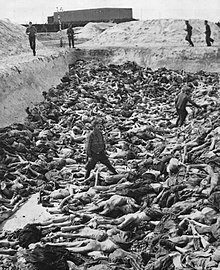 The British Fifth Army Film & Photographic Unit photographed Klein standing in a mass grave in a well-known 1945 photo. Klein and 44 other camp staff were tried in the Belsen Trial by a British military court at Lüneburg. The trial lasted several weeks from September to November 1945. During the trial Anita Lasker testified that he took part in selections for the gas chamber. He was sentenced to death and hanged at Hamelin jail by Albert Pierrepoint on 13 December 1945. 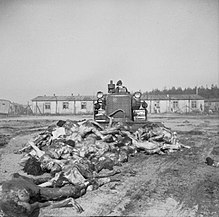 Bergen-Belsen (or Belsen) was a Nazi concentration camp in what is today Lower Saxony in northern Germany, southwest of the town of Bergen near Celle. Originally established as a prisoner of war camp, in 1943, parts of it became a concentration camp. Initially this was an “exchange camp”, where Jewish hostages were held with the intention of exchanging them for German prisoners of war held overseas. The camp was later expanded to accommodate Jews from other concentration camps. After 1945, the name was applied to the displaced persons camp established nearby, but it is most commonly associated with the concentration camp. 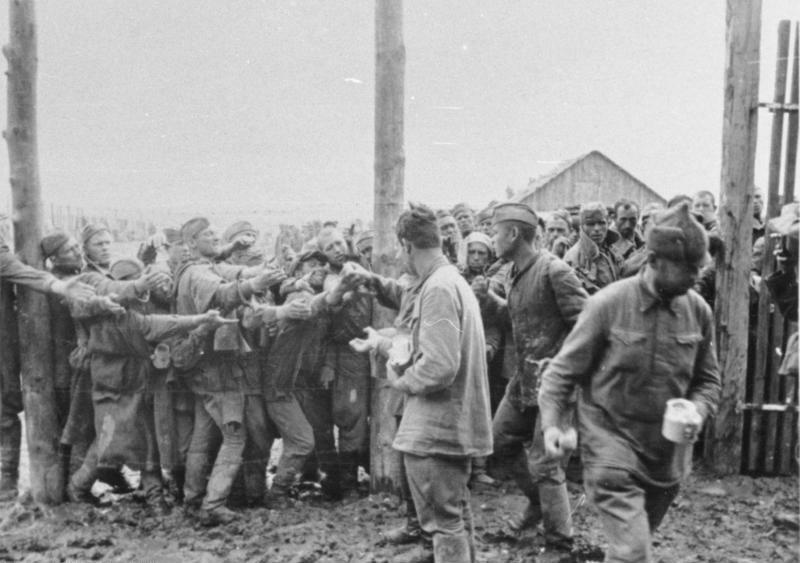 From 1941 to 1945, almost 20,000 Soviet prisoners of war and a further 50,000 inmates died there, with up to 35,000 of them dying of typhus in the first few months of 1945, shortly before and after the liberation. The camp was liberated on April 15, 1945, by the British 11th Armoured Division. The soldiers discovered approximately 60,000 prisoners inside, most of them half-starved and seriously ill, and another 13,000 corpses lying around the camp unburied. The horrors of the camp, documented on film and in pictures, made the name “Belsen” emblematic of Nazi crimes in general for public opinion in many countries in the immediate post-1945 period. Today, there is a memorial with an exhibition hall at the site. In 1935, the Wehrmacht began to build a large military complex close to the village of Belsen, a part of the town of Bergen, in what was then the Province of Hanover. This became the largest military training area in Germany of the time and was used for armoured vehicle training. The barracks were finished in 1937. The camp has been in continuous operation since then and is today known as Bergen-Hohne Training Area. It is used by the NATO armed forces. The workers who constructed the original buildings were housed in camps near Fallingbostel and Bergen, the latter being the so-called Bergen-Belsen Army Construction Camp. Once the military complex was completed in 1938/39, the workers’ camp fell into disuse. However, after the German invasion of Poland in September 1939, the Wehrmacht began using the huts as a prisoner of war (POW) camp. The camp of huts near Fallingbostel became known as Stalag XI-B and was to become one of the Wehrmacht‍ ’s largest POW camps, holding up to 95,000 prisoners from various countries. In June 1940, Belgian and French POWs were housed in the former Bergen-Belsen construction workers’ camp. This installation was significantly expanded from June 1941, once Germany prepared to invade the Soviet Union, becoming an independent camp known as Stalag XI-C (311). It was intended to hold up to 20,000 Soviet POWs and was one of three such camps in the area. The others were at Oerbke (Stalag XI-D (321)) and Wietzendorf (Stalag X-D (310)). By the end of March 1942, some 41,000 Soviet POWs had died in these three camps of starvation, exhaustion, and disease. By the end of the war, the total number of dead had increased to 50,000. When the POW camp in Bergen ceased operation in early 1945, as the Wehrmacht handed it over to the SS, the cemetery contained over 19,500 dead Soviet prisoners. In the summer of 1943, Stalag XI-C (311) was dissolved and Bergen-Belsen became a branch camp of Stalag XI-B. It served as the hospital for all Soviet POWs in the region until January 1945. Other inmates/patients were Italian military internees from August 1944 and, following the suppression of the Warsaw Uprising in October 1944, around 1,000 members of the Polish Home Army were imprisoned in a separate section of the POW camp. 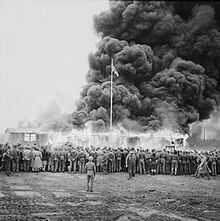 In April 1943, a part of the Bergen-Belsen camp was taken over by the SS Economic-Administration Main Office (SS Wirtschafts-Verwaltungshauptamt; WVHA). It thus became part of the concentration camp system, run by the SS Schutzstaffel but it was a special case. Having initially been designated a Zivilinterniertenlager (“civilian internment camp”), in June 1943 it was redesignated Aufenthaltslager (“holding camp”), since the Geneva Conventions stipulated that the former type of facility must be open to inspection by international committees. This “holding camp” or “exchange camp” was for Jews who were intended to be exchanged for German civilians interned in other countries, or for hard currency. The SS divided this camp into subsections for individual groups (the “Hungarian camp”, the “special camp” for Polish Jews, the “neutrals camp” for citizens of neutral countries and the “Star camp” for Dutch Jews). Between the summer of 1943 and December 1944 at least 14,600 Jews, including 2,750 children and minors were transported to the Bergen-Belsen “holding” or exchange camp. 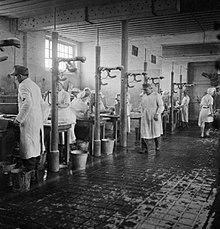 :160 Inmates were made to work, many of them in the “shoe commando” which salvaged usable pieces of leather from shoes collected and brought to the camp from all over Germany and occupied Europe. 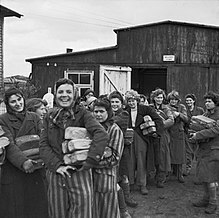 In general the prisoners of this part of the camp were treated less harshly than some other classes of Bergen-Belsen prisoner until fairly late in the war, due to their perceived potential exchange value. 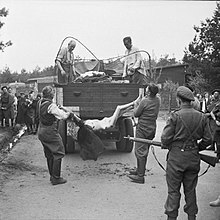 However, only around 2,560 Jewish prisoners were ever actually released from Bergen-Belsen and allowed to leave Germany. In March 1944, part of the camp was redesignated as an Erholungslager (“recovery camp”), where prisoners too sick to work were brought from other concentration camps. Supposedly, they were in Belsen to recover and then to return to their original camps, and to resume work. However, a large number of them actually died of disease, starvation, exhaustion and lack of medical attention. In August 1944, a new section was created and this became the so-called “women’s camp”. By November 1944 this camp received around 9,000 women and young girls. Most of those who were able to work stayed only for a short while and were then sent on to other concentration camps or slave-labour camps. The first women interned there were Poles, arrested after the failed Warsaw Uprising. 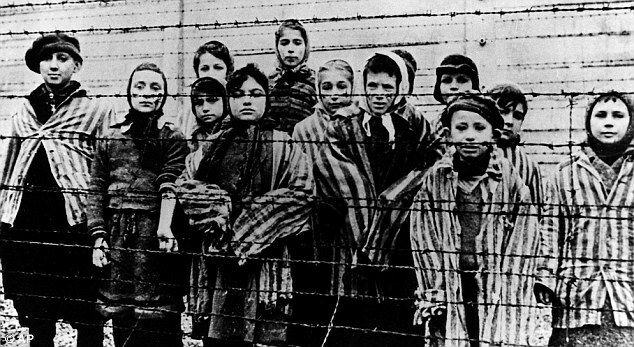 Others were Jewish women from Poland or Hungary, transferred from Auschwitz. 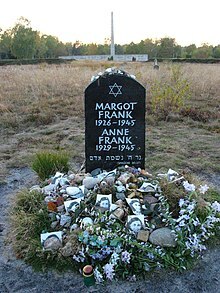 Among those who never left Bergen-Belsen were Margot and Anne Frank, who died there in February or March 1945. 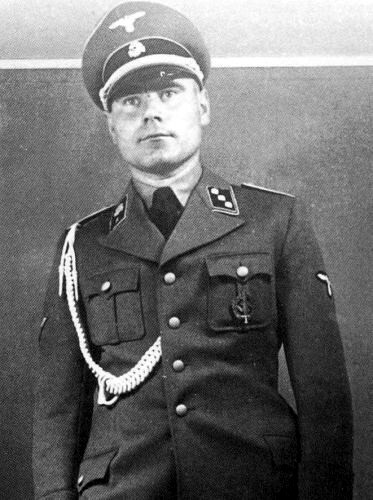 In December 1944 SS-Hauptsturmführer Josef Kramer, previously at Auschwitz-Birkenau, became the new camp commandant, replacing SS-Hauptsturmführer Adolf Haas (de), who had been in post since the spring of 1943. In January 1945, the SS took over the POW hospital and increased the size of Bergen-Belsen. As eastern concentration camps were evacuated before the advance of the Red Army, at least 85,000 people were transported in cattle cars or marched to Bergen-Belsen. Before that the number of prisoners at Belsen had been much smaller. In July 1944 there were just 7,300, by December 1944 the number had increased to 15,000 and by February 1945 it had risen to 22,000. However, it then soared to around 60,000 by April 15, 1945. This overcrowding led to a vast increase in deaths from disease: particularly typhus, as well as tuberculosis, typhoid fever, dysentery and malnutrition in a camp originally designed to hold about 10,000 inmates. At this point also, the special status of the exchange prisoners no longer applied. All inmates were subject to starvation and epidemics. 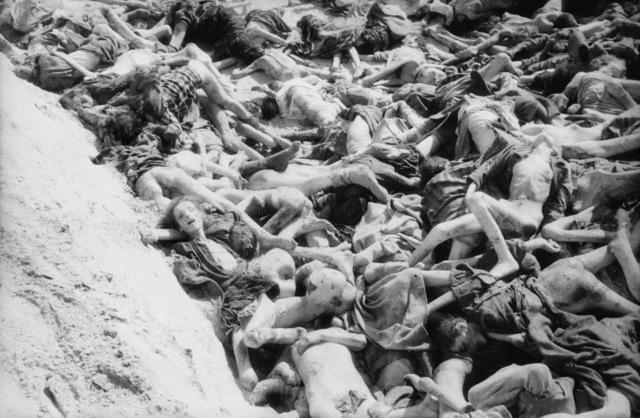 There were no gas chambers at Bergen-Belsen, since the mass killings took place in the camps further east. 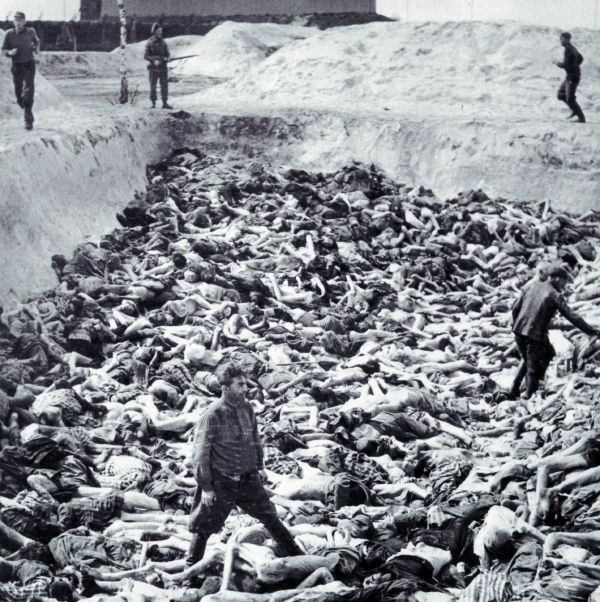 Nevertheless, current estimates put the number of deaths at Belsen at more than 50,000 Jews, Czechs, Poles, anti-Nazi Christians, homosexuals, and Roma and Sinti (Gypsies). Among them was Czech painter and writer Josef Čapek (estimated to be in April 1945). After the war, there were allegations that the camp (or possibly a section of it), was “of a privileged nature”, compared to others. 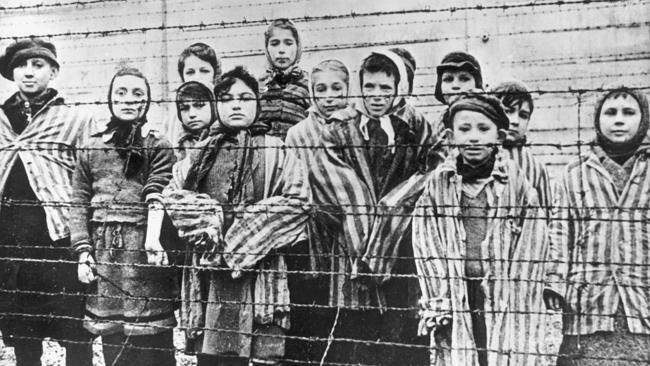 A lawsuit filed by the Jewish community in Thessaloniki against 55 alleged collaborators claims that 53 of them were sent to Bergen-Belsen “as a special favor” granted by the Germans. When the British and Canadians advanced on Bergen-Belsen in 1945, the German army negotiated a truce and exclusion zone around the camp to prevent the spread of typhus. On April 11, 1945 Heinrich Himmler (the Reichsführer SS) agreed to have the camp handed over without a fight. SS guards ordered prisoners to bury some of the dead. The next day, Wehrmacht representatives approached the British and were brought to VIII Corps. At around 1 a.m. on April 13, an agreement was signed, designating an area of 48 square kilometers (19 square miles) around the camp as a neutral zone. Most of the SS were allowed to leave. 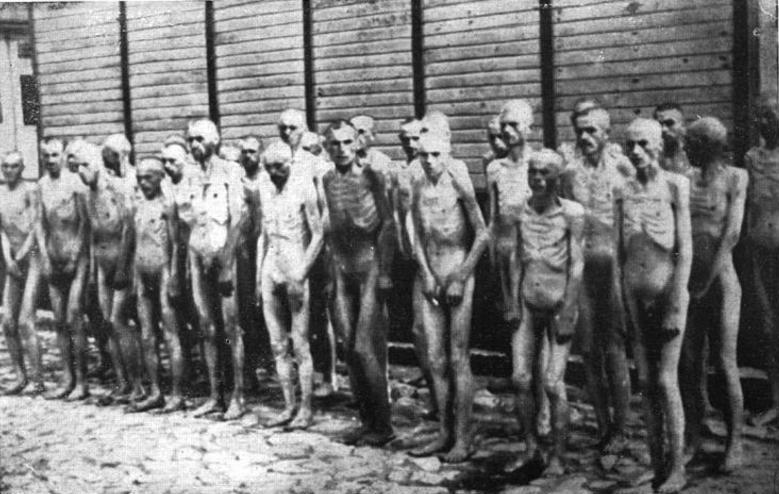 Only a small number of SS men and women, including the camp commandant Kramer, remained to “uphold order inside the camp”. The outside was guarded by Hungarian and regular German troops. 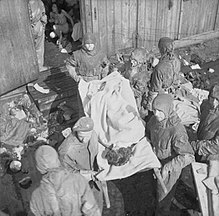 Due to heavy fighting near Winsen and Walle, the British were unable to reach Bergen-Belsen on April 14, as originally planned. The camp was liberated on the afternoon of April 15, 1945.:253 The first two to reach the camp were a British Special Air Service officer, Lieutenant John Randall, and his jeep driver, who were on a reconnaissance mission and discovered the camp by chance. 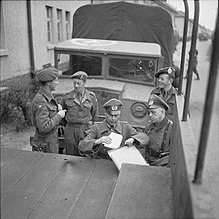 Over the next days the surviving prisoners were deloused and moved to a nearby German Panzer army camp, which became the Bergen-Belsen DP (displaced persons) camp. Over a period of four weeks, almost 29,000 of the survivors were moved there. Before the handover, the SS had managed to destroy the camp’s administrative files, thereby eradicating most written evidence. Two specialist teams were dispatched from Britain to deal with the feeding problem. The first, led by Dr A. P. Meiklejohn, included 96 medical student volunteers from London teaching hospitals who were later credited with significantly reducing the death rate amongst prisoners. A research team led by Dr Janet Vaughan was dispatched by the Medical Research Council to test the effectiveness of various feeding regimes. Bully beef from Army rations. Most of the prisoners’ digestive systems were in too weak a state from long-term starvation to handle such food. Skimmed milk. The result was a bit better, but still far from acceptable. Bengal Famine Mixture. This is a rice-and-sugar-based mixture which had achieved good results after the Bengal famine of 1943, but it proved less suitable to Europeans than to Bengalis because of the differences in the food to which they were accustomed. Adding the common ingredient paprika to the mixture made it more palatable to these people and recovery started. Some were too weak to even consume the Bengal Famine Mixture. Intravenous feeding was attempted but abandoned – SS Doctors had previously used injections to murder prisoners so some became hysterical at the sight of the intraveneous feeding equipment. Many of the former SS staff who survived the typhus epidemic were tried by the British at the Belsen Trial. Over the period in which Bergen-Belsen operated as a concentration camp, at least 480 people had worked as guards or members of the commandant’s staff, including around 45 women. From September 17 to November 17, 1945, 45 of those were tried by a military tribunal in Lüneburg. 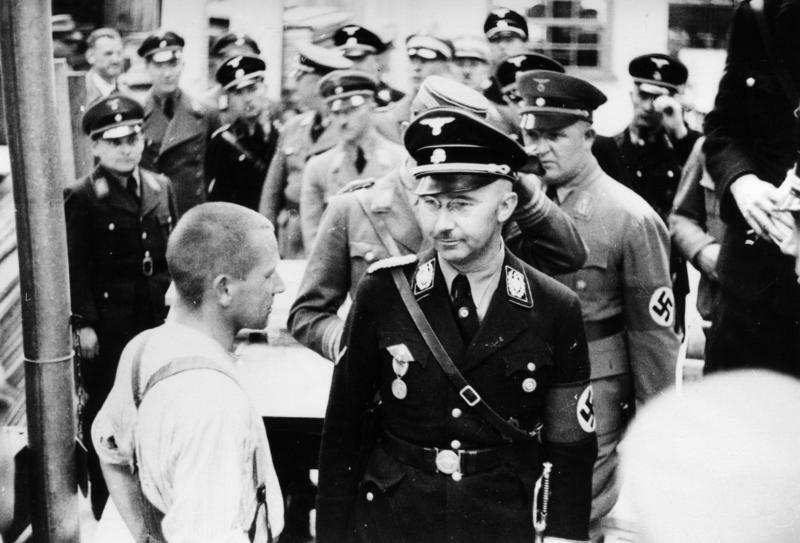 They included former commandant Josef Kramer, 16 other SS male members, 16 female SS guards and 12 former kapos (one of whom became ill during the trial). Among them were Irma Grese, Elisabeth Volkenrath, Hertha Ehlert, Ilse Lothe (de), Johanna Bormann and Fritz Klein. Many of the defendants were not just charged with crimes committed at Belsen but also earlier ones at Auschwitz. Their activities at other concentration camps such as Mittelbau Dora, Ravensbrück, Neuengamme, the Gross Rosen subcamps at Neusalz and Langenleuba, and the Mittelbau-Dora subcamp at Gross Werther were not subject of the trial. It was based on British military law and the charges were thus limited to war crimes. Substantial media coverage of the trial provided the German and international public with detailed information on the mass killings at Belsen as well as on the gas chambers of Auschwitz-Birkenau. Eleven of the defendants were sentenced to death. They included Kramer, Volkenrath and Klein. The executions by hanging took place on December 13, 1945 in Hamelin. Fourteen defendants were acquitted (one was excluded from the trial due to illness). Of the remaining 19, one was sentenced to life in prison but he was executed for another crime. Eighteen were sentenced to prison for periods of one to 15 years; however, most of these sentences were subsequently reduced significantly on appeals or pleas for clemency. By June 1955, the last of those sentenced in the Belsen trial had been released. :37 Nine other members of the Belsen personnel were tried by later military tribunals in 1946 and 1948. Memorial for Margot and Anne Frank at the former Bergen-Belsen site. Denazification courts were created by the Allies to try members of the SS and other Nazi organisations. Between 1947 and 1949 these courts initiated proceedings against at least 46 former SS staff at Belsen. Around half of these were discontinued, mostly because the defendants were considered to have been forced to join the SS. :39 Those who were sentenced received prison terms of between four and 36 months or were fined. As the judges decided to count the time the defendants had spent in Allied internment towards the sentence, the terms were considered to have already been fully served. The area of the former Bergen-Belsen camp fell into neglect after the burning of the buildings and the closure of the nearby displaced persons’ camp in the summer of 1950. The area reverted to heath; few traces of the camp remained. However, as early as May 1945, the British had erected large signs at the former camp site. Ex-prisoners began to set up monuments. A first wooden memorial was built by Jewish DPs in September 1945, followed by one made in stone, dedicated on the first anniversary of the liberation in 1946. On November 2, 1945, a large wooden cross was dedicated as a memorial to the murdered Polish prisoners. Also by the end of 1945 the Soviets had built a memorial at the entrance to the POW cemetery. A memorial to the Italian POWs followed in 1950, but was removed when the bodies were reinterred in a Hamburg cemetery. One of several mass graves on the site of the former camp. The sign simply reads: Here lie 5,000 dead. April 1945. However, for a long time remembering Bergen-Belsen was not a political priority. Periods of attention were followed by long phases of official neglect. For much of the 1950s, Belsen “was increasingly forgotten as a place of remembrance”. Only after 1957, large groups of young people visited the place where Anne Frank had died. Then, after anti-Semitic graffiti was scrawled on the Cologne synagogue over Christmas 1959, German chancellor Konrad Adenauer followed a suggestion by Nahum Goldmann, president of the World Jewish Congress, and for the very first time visited the site of a former concentration camp. In a speech at the Bergen-Belsen memorial, Adenauer assured the Jews still living in Germany that they would have the same respect and security as everyone else. 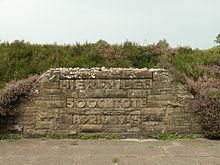 :42 Afterwards, the German public saw the Belsen memorial as primarily a Jewish place of remembrance. Nevertheless, the memorial was redesigned in 1960–61. In 1966, a document centre was opened which offered a permanent exhibition on the persecution of the Jews, with a focus on events in the nearby Netherlands – where Anne Frank and her family had been arrested in 1944. This was complemented by an overview of the history of the Bergen-Belsen camp. This was the first ever permanent exhibit anywhere in Germany on the topic of Nazi crimes. :42 However, there was still no scientific personnel at the site, with only a caretaker as permanent staff. Memorial events were only organized by the survivors themselves. In October 1979, the president of the European Parliament Simone Veil, herself a survivor of Auschwitz and Bergen-Belsen, came to the memorial for a speech which focused on the Nazi persecution of Roma and Sinti. This was the first time that an official event in Germany acknowledged this aspect of the Nazi era. In 1985, international attention was focused on Bergen-Belsen when the camp was hastily included in Ronald Reagan‘s itinerary when he visited West Germany after a controversy about a visit to a cemetery where the interred included members of the Waffen SS (see Bitburg). Shortly before Reagan’s visit on May 5, there had been a large memorial event on the occasion of the 40th anniversary of the camp’s liberation, which had been attended by German president Richard von Weizsäcker and chancellor Helmut Kohl. :44 In the aftermath of these events, the parliament of Lower Saxony decided to expand the exhibition centre and to hire permanent scientific staff. In 1990, the permanent exhibition was replaced by a new version and a larger document building was opened. Only in 2000 did the Federal Government of Germany begin to financially support the memorial. Co-financed by the state of Lower Saxony, a complete redesign was planned which was intended to be more in line with contemporary thought on exhibition design. On April 15, 2005, there was a ceremony, commemorating the 60th anniversary of the liberation and many ex-prisoners and ex-liberating troops attended. In October 2007, the redesigned memorial site was opened, including a large new Documentation Centre and permanent exhibition on the edge of the newly redefined camp, whose structure and layout can now be traced. Since 2009, the memorial has been receiving funding from the Federal government on an ongoing basis. The site is open to the public and includes monuments to the dead, including a successor to the wooden cross of 1945, some individual memorial stones and a “House of Silence” for reflection. In addition to the Jewish, Polish and Dutch national memorials, a memorial to eight Turkish citizens who were killed at Belsen was dedicated in December 2012. We were headed for an airstrip outside Celle, a small town, just past Hanover. We had barely cranked to a halt and started to set up the “ops” tent, when the Typhoons thundered into the circuit and broke formation for their approach. As they landed on the hastily repaired strip – a “Jock” [Scottish] doctor raced up to us in his jeep. “What’s up?” I asked for I could see his face was grey with shock. “What’s it called?” I asked, reaching for the operations map to mark the concentration camp safely out of the danger area near the bomb line. “Belsen,” he said, simply. Millions of words have been written about these horror camps, many of them by inmates of those unbelievable places. I’ve tried, without success, to describe it from my own point of view, but the words won’t come. To me Belsen was the ultimate blasphemy. After VE. Day I flew up to Denmark with Kelly, a West Indian pilot who was a close friend. As we climbed over Belsen, we saw the flame-throwing Bren carriers trundling through the camp – burning it to the ground. Our light Bf 108 rocked in the superheated air, as we sped above the curling smoke, and Kelly had the last words on it. “Thank Christ for that,” he said, fervently. And his words sounded like a benediction. Leslie Hardman, British Army Jewish Chaplain and Rabbi, was the first Jewish Chaplain to enter the camp, two days after its liberation, and published his account in the collective book Belsen in History and Memory. Anita Lasker-Wallfisch describes life in Belsen, its liberation and her stay at the displaced persons camp in her autobiography Inherit the Truth. I saw my father beaten by the SS, and I lost most of my family there… A ransom deal that the Americans attempted saved 2,000 Jews and I was one. I actually went into the gas chamber, but was reprieved. God knows why. In his book From Belsen to Buckingham Palace Paul Oppenheimer tells of the events leading up to the internment of his whole family at the camp and their incarceration there between February 1944 and April 1945, when he was aged 14–15. Following publication of the book, Oppenheimer personally talked to many groups and schools about the events he witnessed. This work is now continued by his brother Rudi, who shared the experiences. Leonard Webb, British veteran from the liberation of the camp. Please consider making a small or large donation as I am very poor and every donation is most welcome and goes towards the cost of running this blog.